Tulle, a net fabric commonly used to make wedding veils and tutus, lends itself to creating romantic, whimsical craft projects. 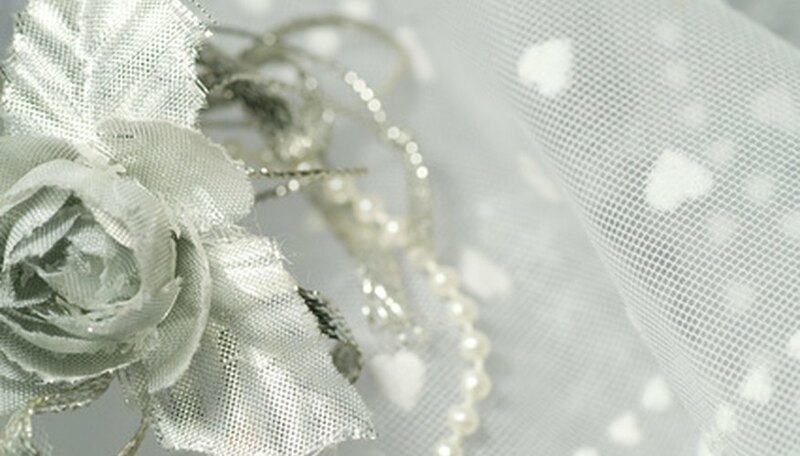 For the DIY bride, tulle is an ideal medium for creating centerpieces for the wedding reception. Wrap items like recycled glass jars or wine goblets with tulle to create soft, romantic containers. Center the object on a piece of tulle. Bring the tulle up towards the top and secure with a rubber band, suggests the Cheap Chic wedding website. Tuck loose ends of the tulle around the rubber band to hide it. Fill the glass jars and goblets with water. Arrange cut collections of wildflowers in the glass jars to create rustic, romantic flower vases. In the goblets float two or three tea-light candles, suggests the Favor Ideas website. Arrange a round mirror in the center of a table. Place a tulle-decorated wreath, the wildflower vases and a candle-holder goblet on the mirror. Place a champagne or wine bottle in the center of the wreath, suggests the USA Bride website. Light the candles in the goblet to create a beautiful, candlelit centerpiece.